Use landmarks to find your way around Disney World. A map of Disneyworld (more correctly called Disney World) can make a central Florida Disney vacation more organized and enjoyable, and there are many different maps eager guests can choose from to find their way around this massive resort complex. These and other issues can mean the difference between a magical vacation with easy navigation or a confusing visit to the wrong part of the Disney complex, and a proper map can help prevent many problems. To be properly prepared, guests should pick up several different types of maps and familiarize themselves with the map legends, features, and coverage areas so they can consult them quickly and easily at any time during their Disney getaway. WDW Info: Overall resort map showing all Disney properties. WDW Info: List of available maps for different parks, resorts, and other individual Disney properties. FloridaBrasil.com: Illustration map and street map of major park locations. 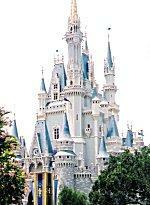 Walt Disney World Resort: Official site with maps of all major parks with interactive links to rides and attractions. AaccessMaps.com: Larger area map showing Disney parks, the Orlando International Airport, and other regional attractions. Once guests have arrived in Florida, they can find brochures and maps at the airport and car rental locations, as well as at local hotels. Maps are also included in Disney World informational material available at each park entrance, information booths within the parks, and in souvenir stores, plus guests can check out the you-are-here maps conveniently located throughout each park. Finding a map of Disneyworld and using it properly is a great start to an easy, stress-free fantasy getaway to one of the largest theme park complexes in the world, and staying oriented will help guests get lost in the fun instead.